June | 2012 | Knit & Run! June 2012 – Knit & Run! The other day it occurred to me that my next 5K is a lot closer than I realized. Uh, oops. Before the Phillies 5K, I prepared weeks in advance with a training plan I found online (I think it was Runner’s World, but I did find one from the Mayo Clinic too). I wrote down my distances and times along with the dates. I tracked my accomplishments like I was raising a toddler. It’s really nice because I’m going to places I’ve wanted to see but never quite got around to visiting. This week’s adventure was Lower Perkiomen Valley Park, which is totally gorgeous and so populated by bicyclists that I was inspired to dig out my old Trek bike to get it ready for a makeover. Poor baby hasn’t seen concrete in just about 10 years. More than anything, I’ ve come to the conclusion that working out is fun. Maybe not when the muscles are whining and the knee is throbbing, but when I turn sideways in the bathroom mirror and realize, my belly is missing, yeah, it’s a heck of a lot of fun. I’m excited about the Color Run. When I did the Phillies 5K, I knew I wouldn’t be the biggest woman at the race, but I definitely wasn’t the thinnest either and it made me a little self-conscious. This time around, I’m leaning more toward, well, lean. I feel better about myself, inside and out, because I’ve put in the work to make the changes I want to see. It’s not easy but it’s worth it. Imagine what I’ll look like by the Runner’s World 5K in Bethlehem in October! I’ve been part of a couple for the last 28 years of my life. I’ve been “single” for the last six months, but that’s also the longest I’ve been single since I was 17. I’ve reached the conclusion that I need to learn to enjoy being alone. It hasn’t been easy and it’s not getting any easier, but whatever is happening in my life is what’s meant to be. Something in this train wreck is meant to make me a better person. Symbolic or not, I finished the last sleeve on my Central Park Hoodie. I just need the time and the daylight to sew it together and finish the edging. I also need it to not be 100+ degrees out, because the very thought of putting on a sweater makes me want to curl into a fetal position ’til October. 🙂 Welcome to summer! When I was a kid, one of my favorite songs was “I Need a Hero”. Likely because I grew up believing I needed a man for my life to be complete. The last six months have taught me…well, maybe not. My life still feels incomplete. I’m working around that, though. People talk about heroes. I write about them every chance I get. 🙂 We all need our heroes. Someone to look up to and aspire to be. And anyone can be a hero. Firefighters and police officers and soldiers are often called heroes, and I think that’s right. In my mind, anyone who can override the “fight or flight” instinct to save or preserve the life of a total stranger deserves to be called a hero. I’ve heard people ask, “If you could have a super power, what would it be?” I used to laugh it off as baloney. After all, no one can have a super power; we can only be the best people we can be. We all have talents at one thing or another, but fly? Put out fires with a single breath? Stop bullets with your bracelets? Let’s be realistic. But this morning I decided, there really is one super power I’d like to have: I’d like to see the future. I mean, there *are* the expressions, “Those who cannot remember the past are condemned to repeat it,” and “The best predictor of future behavior is past behavior,” but sometimes we can’t see that. Some of us (coughcough) make the same mistakes over and over again. Also, patience is not a virtue I happen to possess. I can spend weeks, even months on a knitting project, but I know the outcome there. At least, I usually do. (So sue me. My Central Park Hoodie is three sizes too big. Anyone need a shed cozy?) But lately I get tired of the uncertainty. It wears me down. For my super power, I want to be able to see into the future. I want to know that things are eventually going to be resolved. I want to know that I’m going to be happy. I want to know that my kids will be secure and productive and will experience every joy the world has to offer. I’m not even saying I want to know how my story ends. That, I can live without, but will the problems I’m facing on a daily basis ever go away? Tell me, please. I’m told I must be a tough person to get through this. 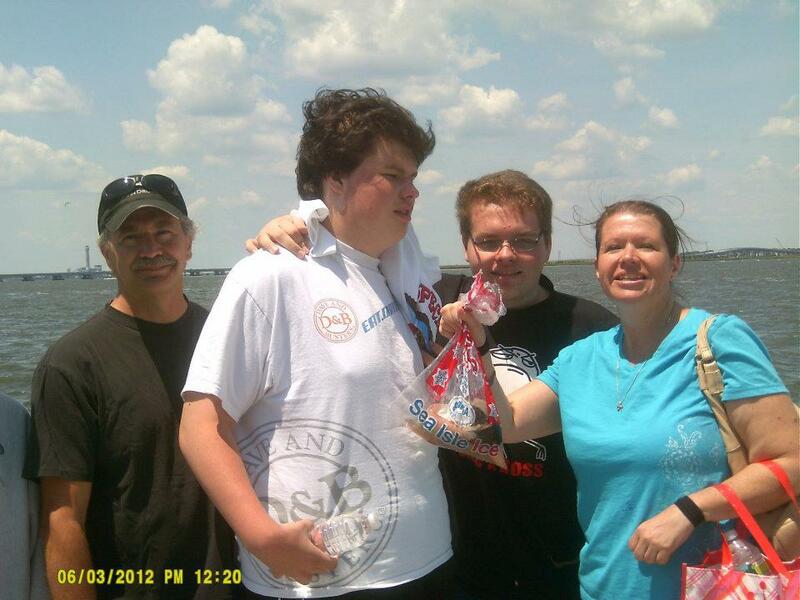 Some might even call me a hero for raising a son with autism. I don’t feel like a hero; I’m just doing what I need to do in order to get through the day, and to make sure the boys have what they need. After Ryan was treated for hip dysplasia back when he was 4, my mom told me that she and my dad were amazed that I held up in spite of everything. My immediate answer was, “I didn’t know there was a choice.” Maybe that’s the definition of a hero: doing what needs to be done without giving consideration to any other options. Tell me: what makes YOU a hero? Don’t be modest; you know you are. Talk about it. Oops. It’s Thursday, isn’t it? But there’s been so much going on that I lost track of time. It’s all been good, too. 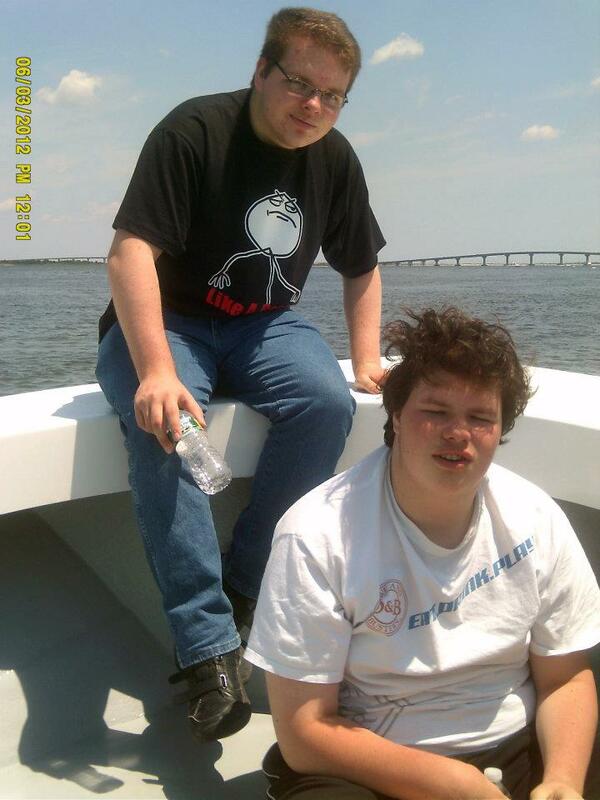 I took the boys to Ocean City, NJ, last weekend and we had THE time of our lives. I honestly think OC is now my favorite shore town. The boardwalk is like Wildwood but not so crazy, and the town itself is WAY easier to navigate than Cape May or Atlantic City. We figured out fast where everything was and how to get there. We had a BLAST at Fishing For Kids–didn’t catch any kids, but we took home two fileted flounders, and yes, this vegetarian ate fish–and met some great people, and we can’t wait to get back! I’m back to writing again. At least, revising. I’m making changes to All or Nothing that I really like. They incorporate a lot of recent personal experience that, for me, makes the characters really pop. I’m feeling good about it, and it’s not at all like pulling teeth, aka writing fresh stuff. But I’m confident I’ll get there again too. My knee is getting better. I figured out what was screwing it up: my foot stool where I sit at the laptop at home. When I relax, my left leg tended to slouch off to the side, and apparently it was putting stress on a tendon or ligament in my knee. I stopped doing it two weeks ago and it’s steadily improving, to the point that for National Runner’s Day yesterday, I ran 3.1 miles and marked a personal best: a mile in 13:02. My previous goal was to break a 14 minute mile, so my next goal is to break a 13 minute mile. I’m told that at some point the body hits a point at which you’re not going to do better. I’m interested in finding out where that point is for me. I’m not there yet. I have my therapist call today and boy, are we going to be on the phone for a while. 🙂 But it’s all good and it’s getting better.